Limited to 4 slices of cake and 1 square cake per transaction. Valid for dine-in and take-away from 12 pm to 5 pm, on 31st August 2017 only. Not valid with pre-orders, pre-payments and / or phone orders. 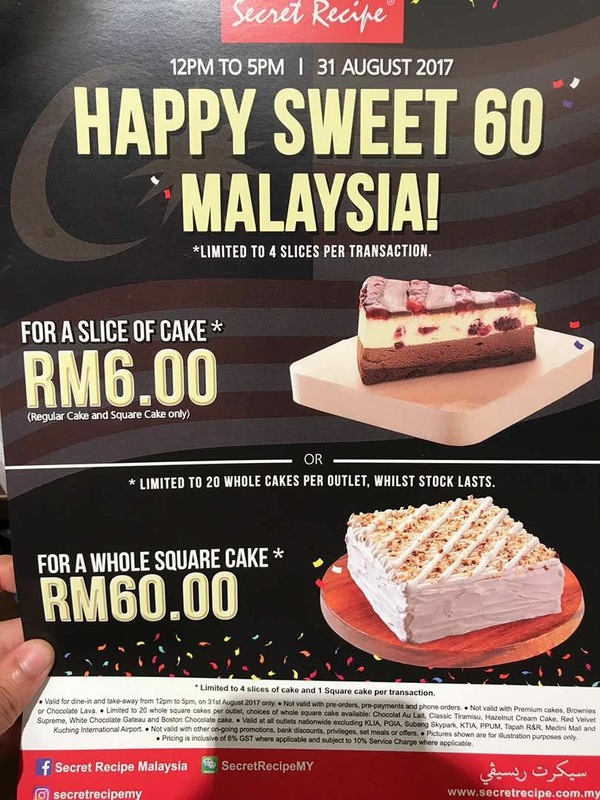 Not valid with Premium cakes, Brownies or Chocolate Lava. Limited to 20 whole square cakes per outlet, choices of whole square cake available: Chocolat Au Lait, Classic Tiramisu, Hazelnut Cream Cake, Red Velvet Supreme, White Chocolate Gateau and Boston Chocolate cake. Pricing is inclusive of 6% GST where applicable and subject to 10% Service Charge where applicable.